Posted by: admin | Comments Comments Off on Strength Training for Basketball – What Type of Training is Needed? 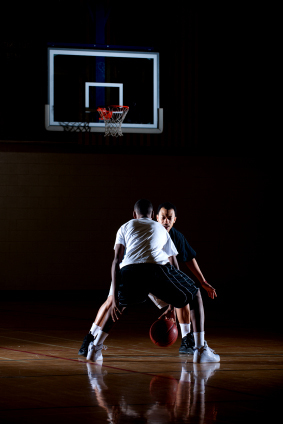 Comments Comments Off on Strength Training for Basketball – What Type of Training is Needed? Posted by: admin | Comments Comments Off on Basketball Tips from Springbak: Shooting The 3 – Rule The Net! 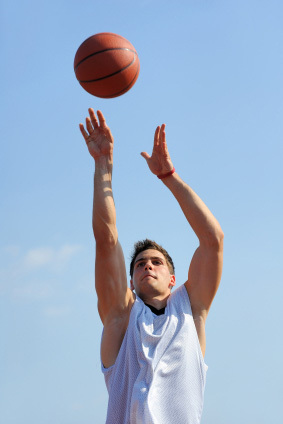 Article by Bill Crow – Former Professional Basketball Player – CEO/ Chairman Springbak, Inc.
* A three can be taken jump shot style or jump set style. * If moving or dribbling toward the basket, by all means take a jump shot where the basketball is released at the second best balance point, the top of the jump. * A jump set, this is where the basketball is released as the shooter is just leaving the floor, provides the greatest balance to the shooter, as just leaving the floor is the greatest balance point. * Greater shooting range because power is transferred into the shot from the legs. * The release is much quicker, less chance of your shot getting blocked. * Your balance is much better because the jump set is stationary versus a moving jump shot. * As just stated, the maximum balance point to a shooter is when the athlete is just coming off the floor. *The jump set can be taken right off the floor position with the shooting hand and leg forward. 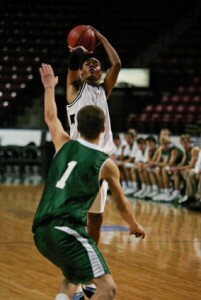 This driving position means the defender will have backed off some, to respect the possibility of a drive to the hoop. Thus making a quick release jump set nearly impossible to pressure. * The jump set can easily be taken off a jab step where the shooter jabs with his pivot foot, then steps back and shoots. * The basketball should be high enough for the jump set to be a one upward arm motion shot, this is usually chest to chin high. * Set the feet in a driving stance with one foot slightly forward. * When jumping to begin the shot, jump with a bounce. A bounce is a one motion jump where the knees are bent at the same time the calves flex and pull the foot off the floor. * A quick bounce will get the greatest ‘spring’ return from your Springbak Springsoles, as this will give them the greatest compression and thus the greatest spring. * This spring effect coupled with your bodies increased strength(because of the Springbak’s – remember the strength, balance and stability patent Springbak has been issued)should add two to three feet to your shooting range. * As the shooter does a quick bounce, the one arm stroke begins at the same time (see prior shooting blog for proper shooting fundamentals. When both are done at the same time, maximum power is achieved, and the defender is given no advanced warning as the shot is off before the defender can react. * Timing on a three point shot can be practiced by holding the basketball at chest or chin level, take three bounces, and release the ball on your third bounce. The spring action on your fingers should be happening at the maximum explosion point of the legs. If this timing is achieved your legs will be providing most of your shooting range. * Please review my prior blog post on how to get elastic whip and your fingers spring action into your shooting release. This is very important information used when I coach college and professional level athletes! Remember, Rule the Net! * The last step is to (through constant practice) time the elasticity in your wrist and fingers with the explosive bounce in your legs. When this extremely important timing becomes coordinated, achieving your 3 point shooting range will become much easier. ** Remember, our Springbak Springsoles will help greatly in achieving that 3 point shooting range you are looking for, and your coaches are watching, believe me! * Also, remember your arm stroke should be explosive and at at least a 60 degree angle. This 60 degree angle will maximize power transfer from the legs. This 60 degree angle of the arm will give greater arch, which helps in two ways. First, it’s harder to pressure, and you are shooting in a circle rather than an oval when the ball comes down. Enjoy these 3 point shooting tips, as you are learning the same things I teach at the University level and to professional athletes – See you on the floor! Bill Crow – President & CEO Springbak, Inc. Comments Comments Off on Basketball Tips from Springbak: Shooting The 3 – Rule The Net! As I have mentioned in my prior blog on shooting, the key to becoming an outstanding jump shooter is to develop a tight, quick and short shooting stroke. This is the key to balance on a jump shot, as the balance point is at the apex or top of the jump. As soon as the top of the jump is reached, gravity pulls the shooter back to the floor. If you have the opportunity to watch shooting strokes of the greatest shooting scorers in basketball history (Jerry West, Elgin Baylor, Oscar Robinson or Michael Jordan) on You-Tube, what you will observe is a shooting stroke no more than four inches long. The question remains, how does one develop enough power to get the ball to the basket in such a short motion? The answer, elastic reaction of the tendons in the wrist and fingers. Next question, how does one bring an elastic whipping action of the wrist and fingers into the shooting release if one does not have it to begin with? This is the starting point. Anyone can whip off a one handed pass directly from his or her waist or chest area to someone fifteen feet away with a short, quick, explosive pushing motion coming from the shoulder. If the wrist is back and relaxed and the fingers are consciously stretched, then the basketball will come off the fingers with an elastic whipping action, back spin, speed and power will be directed to the basketball with a very short pushing stroke. Try it, anyone can do this. The Challenge mentally is to raise this short, quick passing motion 60 degrees to where this short, quick passing motion becomes a shooting stroke with the same whipping action that is accomplished so easily when passing the basketball. I have worked with scores of high school, college and professional level shooters in my lifetime and have discovered that this transition is entirely mental. In other words, physically easy to do but psychologically hard because of a shooting release developed from youth with only limited elasticity being used in the fingers and wrist because a much longer arm stroke(which almost everyone has)will not generate maximum elasticity in the wrist and fingers. This only happens with a short, quick, explosive push from the arm and shoulders, if accompanied by a stretching of the fingers during the entire passing or shooting motion. To help break this psychological barrier, I instructed players first to whip their passes against the backboard of the basket after whipping a pass to someone standing under the basket. After whipping a number of passes on about a 30 degree angle off the backboard, I tell the athlete all he or she has to do(psychologically)is raise that same passing motion to 60 degree angle (90 degrees being straight vertical) and maintain that same whipping action of the wrist and fingers while passing the basketball on that same 60 degree angle from now the shoulder and not the chest. I then instruct athletes that if they can psychologically maintain the same whipping action of the wrist and fingers that they were able to do so easily when passing the basketball with a one hand pushing motion, that they now have the start of a short, quick shooting stroke that can be accomplished with the elastic whipping action of the wrist and fingers incorporated into their shooting release. This is step one. However also the hardest to mentally overcome, work on this one first! If you feel this spring action of the fingers whipping through the basketball at release, you are beginning to experience the KEY to controlling your shooting release on the basketball. After this critical step, shooting practice becomes a matter of focus and coordination of the spring action of the fingers in the shooting release to make your release shorter, tighter and quicker. 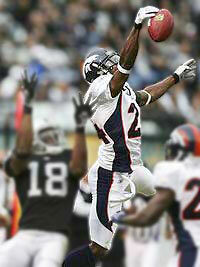 Step two is to coordinate a bouncing action of the legs with the short arm stroke of the shooting motion. When you time the upward bouncing action of the legs with the short upward shooting motion of the arm, you are well on your way to becoming an accomplished 3 point shooter. Good luck with your practice sessions and have fun!